November is Adopt A Senior Pet Month and Adopt A Senior Cat Month, a cause close to our hearts. 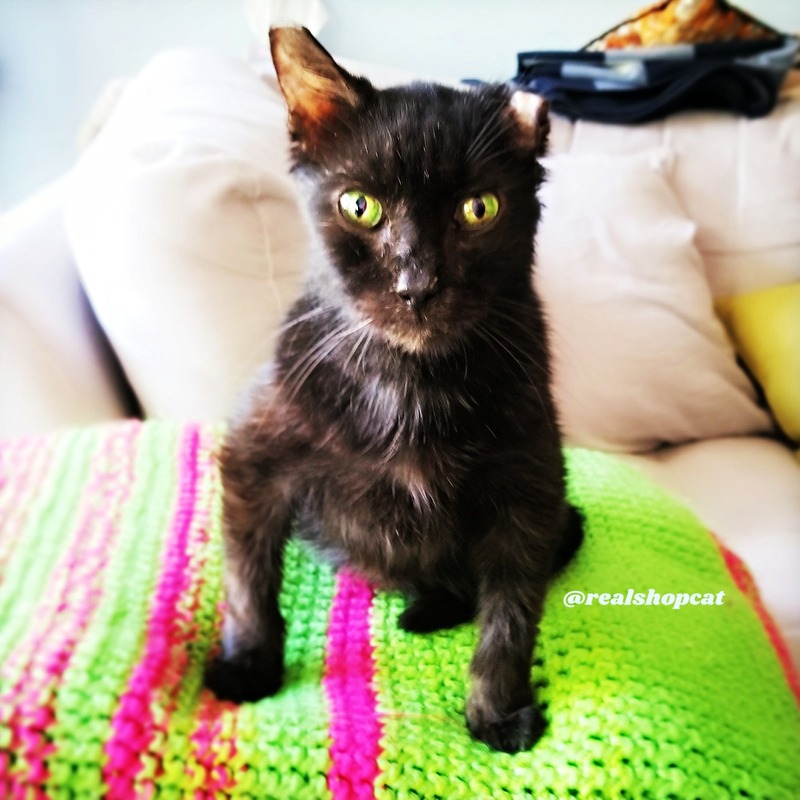 We’ve featured many older cats here and on Instagram but one old cat, Shoppy @realshopcat stole our heart. Our Clyde is happily giving up his usual Monday blog to feature him in what we’re calling the happiest happy ending. We are crazy about older cats and here are a few reasons to consider adopting a senior cat. Our soon to be 19-year-old cat Clyde, is our every day inspiration. It feels like yesterday when we brought home from the shelter for his first Gotcha Day. We believe all cats deserve a second chance. When given half a chance, miracles can happen. 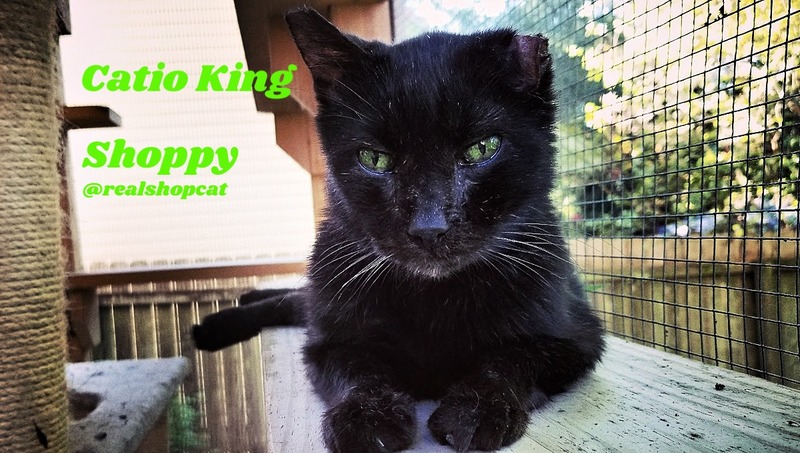 Meet Shoppy, our pick for senior cat adoption ambassador. 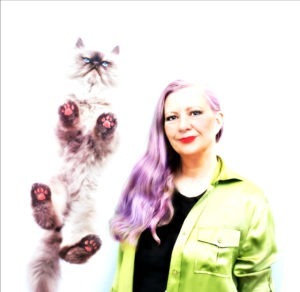 This is his story as told by his cat mom, Johnna Jackson. I first saw Shop Cat when I was at Austin Pets Alive placing one of my foster cats on the adoption floor. He was lounging in one of the community cat rooms, front and center, trying to get the attention of anyone who came close. I had never seen such a raggedy looking cat and yet so confident! He was 15 years old, black, deaf, FIV+, with only two teeth, and missing most of his ears. When I saw first met him three months ago he’d been there for almost six months, I knew this old guy needed a break from shelter life – at his age, he didn’t have time to waste! I took him home as a foster and it didn’t take long before my partner and I knew that he was here to stay. We began to call him Shoppy. We don’t know much about his past. Shop Cat came to Austin Pets Alive from another shelter where he had been surrendered as a stray with the name “Shop Cat,” so we assume that he hung out at some kind of automotive (or other type of) shop. He was in rough shape. One of his ears had the tip cut off as the result of TNR, which might have been the only veterinary care he ever received.He may have wound up in the feral colony looking for food but he must have had a home at some point but not remotely feral. 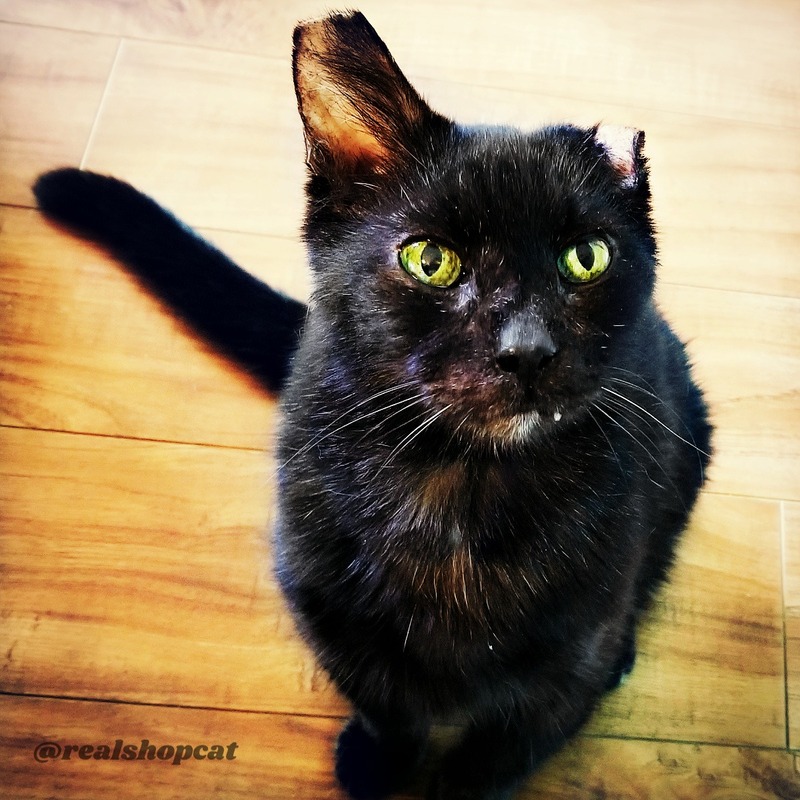 Shoppy has endured much pain from severe dental disease, was deaf (likely caused by chronic untreated ear infections), and his crinkled ear was likely the result of a hematoma. To make matters even worse, he was bone-thin and also had ringworm and feline calicivirus, so he quickly found himself on the shelter’s euthanasia list. Fortunately, the good people at Austin Pets Alive pulled Shop Cat before he was euthanized and gave him a second chance. Shop Cat quickly made his will to live known, and his health began to drastically improve after spending time in APA’s medical clinic, calicivirus treatment center, and ringworm program. It didn’t take long for Shop Cat to become a staff and volunteer favorite – he would purr through his exams, and wanted so much attention that eventually they realized that the only way to make him happy was to carry him around in a sling, so he was with someone at all times. I am forever grateful to the kind people of Austin Pets Alive who never gave up on him. We’re trying very hard to give Shop Cat the retirement he deserves. He’s pretty energetic for an older cat, and enjoys playing with feather wands and crinkle balls. Sometimes even wrestling with the foster kitties. He loves the company of both cats and humans. On sunny days, he enjoys lounging in the catio and chittering at any birds who come close. Very talkative and super sociable, he has an unusual meow that famously commands attention and why not. He deserves the most golden of golden years. He loves food (probably because he went hungry most days of his life), so in addition to his regular meals, we give him kitty treats throughout the day because nothing makes him happier. We both work from home so Shop Cat gets plenty of attention. On work days, he can usually be found in our home office with us, curled up in his cat bed near our desks. Despite all he’s been through, he is the friendliest, most loving cat I have ever met. We hope that other people will learn of Shop Cat’s story and be willing to open their hearts to a senior pet. We made an Instagram account in the hope of raising awareness and promoting the adoption of less adoptable pets like Shop Cat. 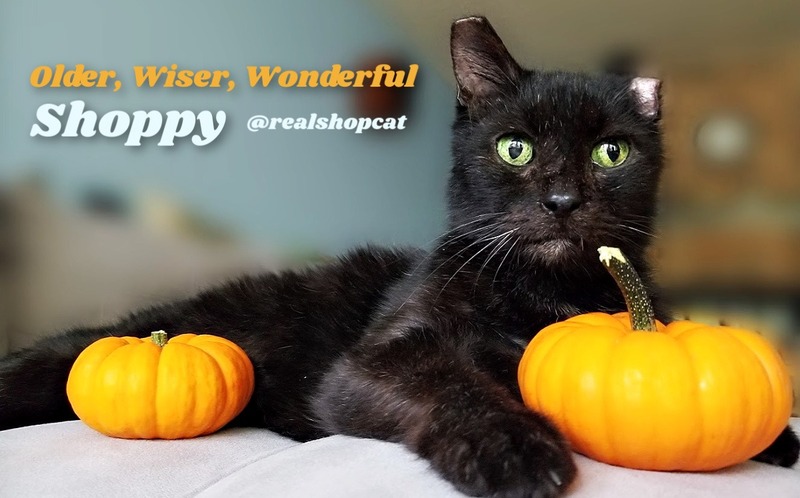 If you’d like to follow his adventures in retirement, you can find us on Instagram @realshopcat Shop Cat has an endless supply of love to give, and we feel like we hit the jackpot by finding this sweet, special boy. and specially-abled cats. Long may he rule in joy and comfort. friend Jace, who may become his permanent pal. Kudos to Austin Pets Alive for their detailed special needs and super seniors adoption profiles like black cats Sweet 16 Larry Ivan the not so terrible, 12, Larry Bruce,14 Oh, THAT FACE! Soft Spot, 17 Yes, please. What a stunner! India,14 Those curled whiskers! I want groom her so badly. ALL senior adoptions fees $0. Won’t you share this post or one of the adoption profiles to help give them a second chance? Thank you for sharing this very inspiring story. I also have a senior black cat and she is from the shelter, we got him 3 years ago, and until now she’s still our precious cat. We support the pet adoption campaign. Awww….That is all I have to say…just plain Awww! Shoppy is awesome! We are so glad his tale has a happy forever home ending. What an awesome guy, plus much praise to those that saw his worth through the superficial outer roughness. More homes to seniors, and the not so perfect purrers. This is such a sweet story. I am so happy Shoppy has a forever home to retire in now. Luvs and thanks to all that do such wonderful things for those that cannot protect themselves. There are such stories in those eyes. Every being deserves love and care and just because they or we are older does not mean that we should be overlooked or forgotten. We still have many, many wonderful moments of love to share. 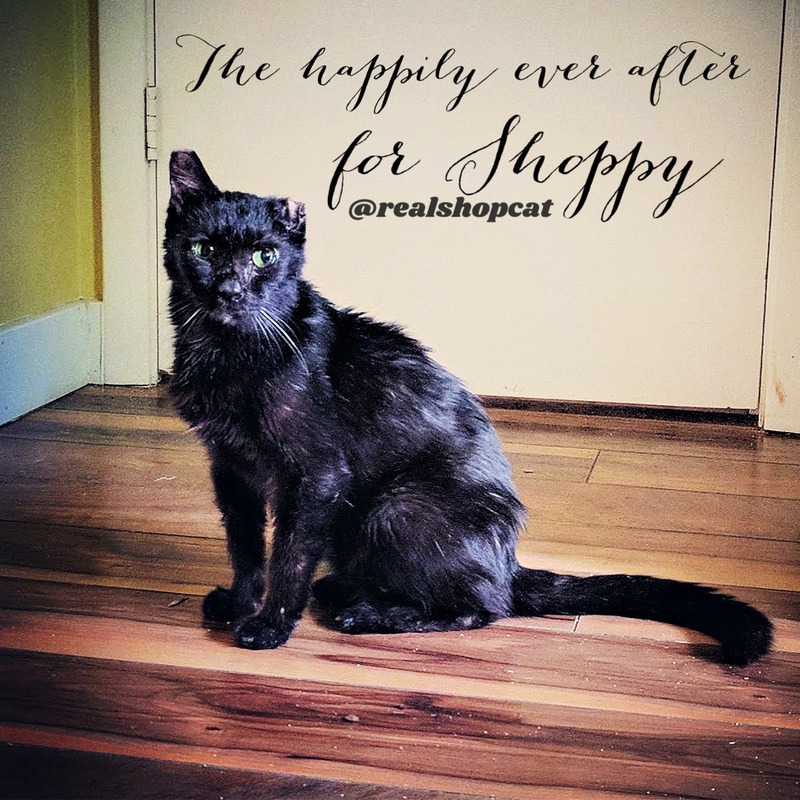 We are so glad to hear about Shoppy and the wonderful place that helped him get a second chance at love and happiness and the peeps that are giving him that. Love is such a wonderful thing! We pray that more and more will find this kind of love! Shoppy is a real inspiration. So happy that he is in the BEST forever kind of situation for his retirement years! He certainly deserves that and more. Older cats in shelters usually have lost their home – at least once – and what better thing to do when looking for a pet than to provide security and love to one who had it and lost it OR never had it at all. Live longER and prosper Shoppy……………! Shop Cat is so awesome! People are missing out when they pass over these not-so-gently-used seniors. Layla this is brilliant. Can we have share buttons to celebrate Shoppy please? Thanks Marjorie. The share buttons are there. Are you on mobile? fb sharing is glitchy. I love using Buffer to share. I am so so so happy that Shoppy is doing well now. Cheddar is very happy for Shoppy, and hopes that all cats, especially seniors, like Cheddar, have a really great senior life. Ched is 16 and 1/2. Oh my cat! What a sweet senior. Wishing him many more years chattering away at his birds in his catio.